2015 China Yearbook of Household Survey is an annual statistical publication whichreports income,expenditure and living conditions of households nationwide as well asby urban/rural,province,income quintile and economic region.It also provides basicstatistics of farm household investment in fixed assets and rural poverty,labor migra-tion profile and other data gained from Household Survey. The data of 2013 and after in this yearbook originate from Integrated Household Surveyof Income,Expenditure and Living Conditions implemented since 2013.The data priorto 2012 originate from Urban Household Survey and Rural Household Survey separatelyconducted,and are aggregated according to the scheme of Urban Household Surveyand Rural Household Survey correspondingly.The information of Hong Kong SpecialAdministrative Region,Macao Special Administrative Region and Taiwan Province arenot included. 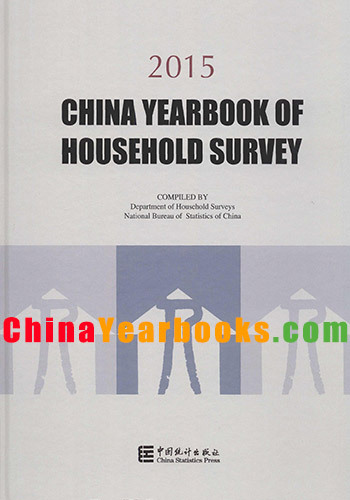 The book includes an Introduction to Household Surveys of China and seven parts oftables:(1) Income and Expenditure of Households Nationwide,2013-2014;(2) Incomeand Expenditure of Households by Province,2013-2014;(3) Income and Expenditureof Urban and Rural Households for Selected Years;(4) Basic Statistics by Groups ofUrban and Rural Households,2005-2012;(5) Income and Expenditure of Urban andRural households by Province,2005-2012;(6) Basic Statistics of Farm HouseholdInvestment in Fixed Assets in Rural Area;(7) Other Statistics from Household Surveys. Statistical discrepancies due to rounding are not adjusted in this yearbook. The notes concerning the whole table are placed at the beginning of the table,while thenotes concerning individual indicators are placed at the end. Notations used in this yearbook: “…”data are not available; “#”major items; “*”see footnotes below”.